20x20x4 Astro-Sorb PLUS Carbon Merv 11 Welded Wire Pleated | Air Filters, Inc.
Astro-Pleat™ Astro-Sorb™ MERV 11 welded metal wire activated carbon 4-inch air filters provides light to moderate odor control of smoke, pet odors and cooking odors that are absorbed and trapped with in the millions of microscopic carbon pores. With a combination of granular activated carbon (Removing gases and odor's) thermally bonded to the polyester non-woven fibers (Rated for Arrestance of 95% and Dust Efficiency 65%) that offers maximum carbon surface area, consistent carbon distribution with minimal pressure loss. Primarily used for general indoor air filtration in heating, cooling and ventilation equipment/systems but also can be applied as an excellent pre-filter for use in commercial and industrial high efficiency systems. MERV 11 rated air filters meet and/or exceed standard requirements for American Lung Association® Health House® and utilizes electrostatically charged, 100% synthetic media which offers significantly higher particulate efficiency than regular poly/cotton media pleated filters, with little change in static pressure. MERV 11 filter media will not promote the growth of bacteria, mold, mildew, or fungi in normal operating environments, and has not been chemically treated. Astro-Pleat™ MERV 11 pleated filters are an ideal upgrade from standard disposable panel filters. Air Filters, Inc.™ Astro-Pleat™ MERV 11 seasonal 4-inch pleated air filters effectively reduce/remove pollen, dust, pet dander, dust mites, mold spores and environmental smog from circulated indoor air. Filtering these airborne particles can help alleviate allergies and sinus irritation that can cause watery eyes, itchy throat, coughing, and sneezing. Additional benefits are extending the life of your Air Conditioning / Furnace system by allowing the system to work more efficiently and economically. Air Filters, Inc.™ Astro-Pleat™ MERV 11 seasonal carbon pleated 4-inch pleated air filters use the optimum blend of synthetic fibers to insure high dust holding capacity and filtering efficiency. * MERV 11 seasonal carbon pleated air filters granular activated carbon thermally bonded to the polyester non-woven fibers. * MERV 11 seasonal carbon pleated air filters media is thermally glued to Welded Wire backing to prevent the media from sagging during the filter's use. * MERV 11 seasonal carbon pleated air filters pleats are formed in a radial configuration to insure proper dust loading. 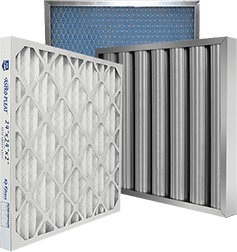 * MERV 11 seasonal carbon pleated air filters cartridge is encapsulated in a heavy duty die cut beverage board frame to insure filter integrity in high moisture applications. * MERV 11 seasonal carbon pleated air filters face of the die cut is internally glued to the apexes of the pleats to insure maximum endurance under adverse conditions. * MERV 11 seasonal carbon pleated air filters media is electrostatically charged. * MERV 11 seasonal carbon pleated air filters contain 9 pleats per linear foot which creates a greater surface area to catch airborne particles.